Which is what it is, so far, seeing as I won’t be getting my loan Perkins machine for a couple of weeks to actually produce proper braille. 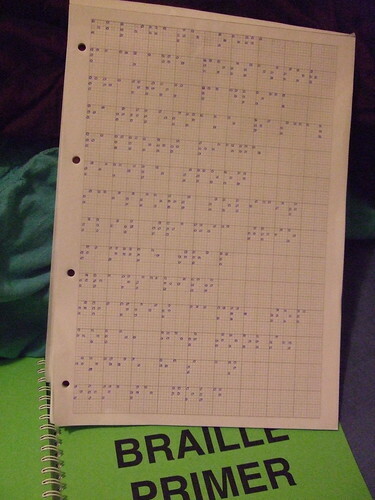 Knowing myself, however, I wanted to get started learning straight away (which I did yesterday, as when I put things off it’s hard to get them going), and the point here is really for me to be able to sight-read braille, so I can check that what comes out of the embosser is correct. Anyway, don’t bother struggling to work out what this says, as it’s just an assortment of words and phrases using letters A-T (I’m on lesson 2). If you’ve followed a touch-typing course you’ll know the kind of thing. (If you are a fluent braille sight-reader and can quickly tell me have I made any obvious mistakes I’d really appreciate it, however.) I’m using graph paper to try to get the spacing consistent, and I think it does look better than the first exercise, that I did on scraps of paper. This book has a good introduction explaining what it provides, including an overview of the changing styles of children’s clothing. The illustrations are beautifully reproduced, and were obviously of a very high standard in the first place. I’m doing a simple (but I think pretty effective) granny-square lap blanket for a lady I know. It matches the upholstery on her armchairs and sofa pretty well, and I thought it’d be nice for warding off those stray breezes of spring and autumn (and perhaps even summer, depending what kind of one we’re in for). It’s great to be crocheting again, and this is working up really fast. As I mentioned yesterday, I finished off the Capital Ring on Wednesday last week, so here are some of the pictures from the walk. 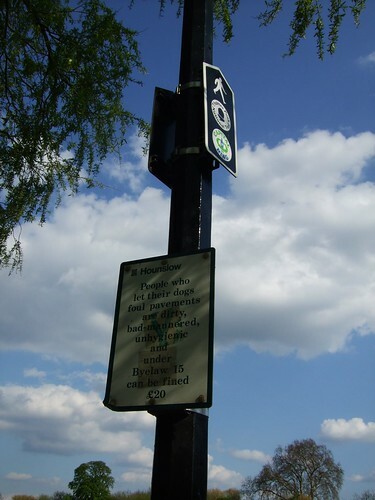 I began at Wimbledon Park Station and walked to Boston Manor Station a little beyond Syon Park, so about nine miles according to this sign, although the book seemed to suggest it would be nearly eleven. 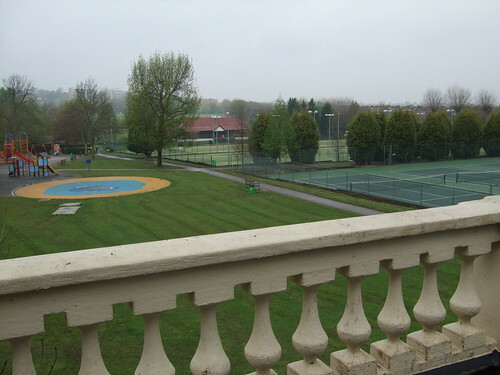 From the station I walked through Wimbledon Park, which is attached to the All England Lawn Tennis and Croquet Club, although I couldn’t work out how many of the multiple less prestigious court belong to the club and how many to the park. 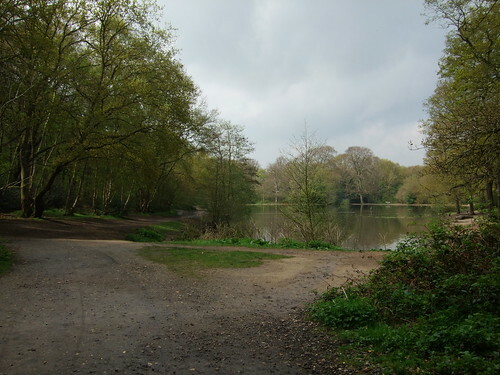 On to Wimbledon Common, and Womble territory! When I took this picture I noticed my battery was dying, so didn’t take any more until near the end of the walk, unfortunately. Hounslow Council evidently don’t pull many punches. And this is where I met up with where I’d walked before on the Ring. The funny angle is the only one where I didn’t get glare on the sign. On the Thursday I went with some friends to Thorpe Park and had fun on some roller-coasters, despite the rain, hail, thunder and lightning. I think I should be long asleep, but here I am, finally trying to let you know what I’ve been up to. Be warned that this may become a long post, given in order of the books I finished reading, and with related events discussed with them. This is the book I gave the kids last year when I stayed with them, and apparently they still like it lots, which is great. I got asked to read it to them a couple of times, and it’s still a good retelling of a child’s approach to Passover. 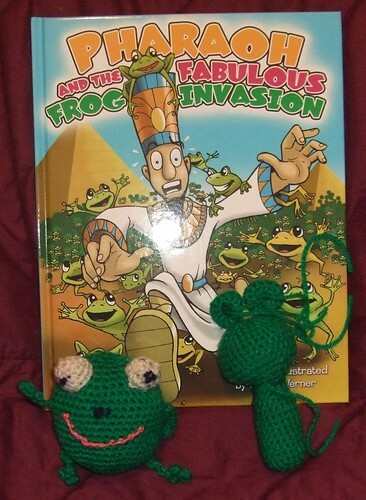 They seemed to like this year’s book (the frog one), and the toys I made to go with it as well, so I was most gratified. I was thinking of just putting down the plain Haggada text as my book, seeing as I read it twice (once on each of the first two nights of Pesach), but then I challenged myself to read the entire commentary this year, rather than just some of it, as I normally do, so I’ve put the specific edition here. This isn’t a highly academic edition, whose comments more often use an anecdote or story by or about Rav Shach to make the point than give over a specific one of his teachings, but when read in its entirety has a lot to give over. I was well into Chol Hamoed before I finished it, but certainly didn’t find anything that would only be relevant on Seder night. 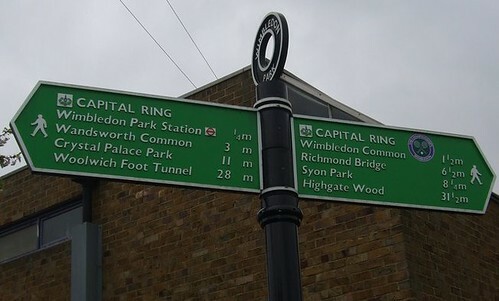 I finished walking the Capital Ring last Wednesday, and I have lots of pictures to put up of the walk, although I amn’t convinced I’ll get them up tonight. I’m really pleased to have done it, and in doing so to have finished the book too, of course! 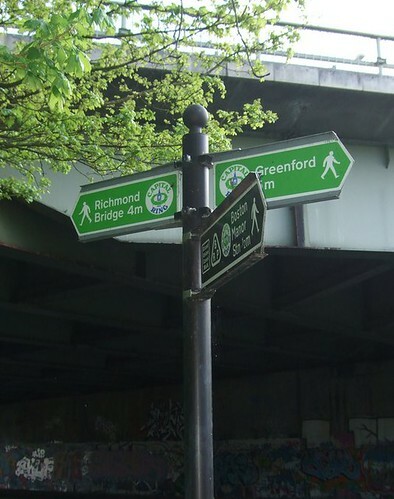 I think I’ll focus on the Thames Path next, and I’m going to count the overlap I did last week as part of that, considering it was about three miles, rather than a few hundred metres. Now this is an interesting read, for the history, the interest, the inspiration and the wonder it inspires. It consists of anecdotes and true tales of the Jewish community of Aleppo, or Aram Soba as it was also known, in Syria, of the 19th and 20th centuries (of the civil calendar), and the members of that community (and their descendants) who moved to Israel, America and other places. Certain Rabbis and other community leaders come up over and over again, and these are given a brief biographical sketch each at the end of the book, but even so enough information is given in each story that one should be happily able to dip in and out of the book as one wishes. My own style of reading such books tends to be to open it at random once or twice, and then if the book catches my attention to read it from cover to cover, but I think part of the reason books of short stories and inspirational pieces do well in the Jewish community is that they can be perused in so many ways, to suit each reader, especially those who do not have/take the time to concentrate on a longer work. I didn’t manage to see more than snippets of the recent widely acclaimed BBC production of Mrs Gaskell’s novel, but I picked up the new edition produced to go with it, and I’ve really enjoyed the tales therein. The narrator’s voice is always well judged and very telling, whether overtly but oh-so-gently sarcastic (as much of that narrator as of those others described) in Cranford or “Mr Harrison’s Confessions” or in remembered loving obsequiousness in “My Lady Ludlow”. We are shown small worlds where social form pretends to be the most important thing, since so often financial status has not kept up with inherited social rank, and yet personal relationships can win out in the end, so long as the niceties are not all pushed asunder in one fell swoop. These small islands of feudalism (particularly in “My Lady Ludlow”) are inexorably being pushed away, or at least remoulded, by a changing wider world of Revolutions political and Industrial, and I find it fascinating to see the downsides of these put so forcefully, coming from an education system (across several countries) which has always put these forward as wholly positive. As someone who does fibre handwork by choice, I can appreciate that industrial spinning and weaving were great threats to those women who made a living through decorative and useful piecework, and yet as someone who has never yet used handspun yarn, let alone made it herself, and the vast majority of whose clothes and other fabrics are machine made (even if I do by either fair trade or second hand wherever I can) I would not want to entirely turn back the clock on this progress. Regulate it for workers’ safety and environmental impact, and ensure those workers are well paid, definitely. Educate people to know where their food, clothing and shelter comes from, probably. Stop technology going further than suits me personally, certainly not! I was given this by my dear brother, and it is funny. Rather un-PC, but usually in an affectionate, or at least accepting way. At least, that’s the way I choose to read it. It’s a selection of entries made to the Overheard in Dublin site, which is apparently one of a whole stable covering cities and countries around the world. I said I’d be three days, and it’s been a week. It’s just that without my crochet I don’t feel like blogging, even though I have lots of books and photographs for you. I’ll see what I can do later this afternoon, once I’ve cooked for Shabbos. Otherwise it’ll be Sunday night or Monday, once Pesach is over. 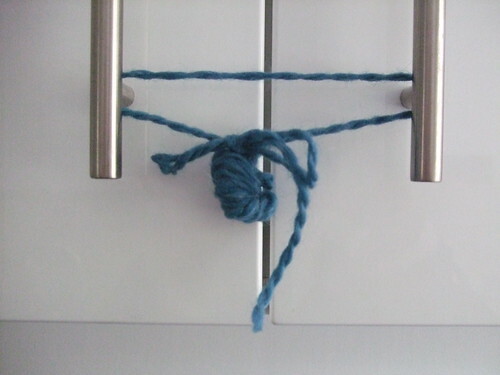 We’re just about ready for Pesach (mostly covering of kitchen surfaces and food shopping to do) and this is about as much playing with yarn as I’m going to get to do for the next eight or nine days. 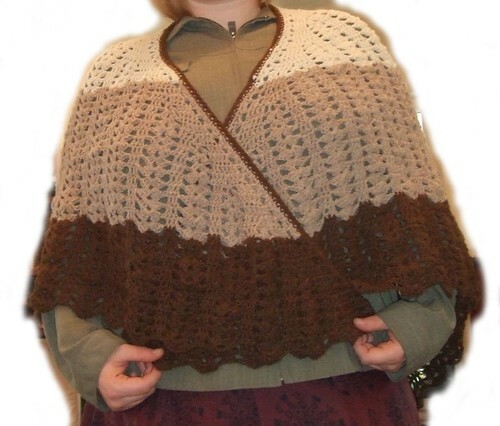 (I don’t crochet on Chol HaMoed, and obviously not on Shabbos or Yom Tov. On Passover we don’t use the cutlery or crockery from the rest of the year, so cupboards containing them are taped or tied shut to remind us not to submit to the force of habit.) I should get lots of reading done, however! I’ll be offline for the next three, but then should be able to report back on how my Pesach projects have gone down. Wishing everyone a happy and kosher Pesach, or a great weekend, depending! The theory is that instead of reading or crocheting (neither of which I’ve done much of this week) I’ve been cleaning and listening to podcasts (the latter has certainly been happening…). I did finish listening to China Court on Forgotten Classics, and got quite into it with large chunks together. I do like being (well) read to, and Julie’s selections are always interesting. She is proactive about trying to deal with copyright issues, and actually got permission from Rumer Godden’s estate to podcast this novel, which I hadn’t come across before. I have read and enjoyed several (although nowhere near all) of Godden’s books, and am appreciating the variety of her writing more and more. This book has the capacity to be very confusing, as it interweaves the stories of several generations of the same family and household, where the house itself is the most important common factor. Julie well picks up Godden’s skillful differentiation of the voices involved, and listening to (or I assume reading) chunks of this together also helps to keep it all together. China Court, while passed down the paternal line through the generations is always shown as the domain of one or more strong women, many of whom come in as wives, so bringing in new family values. In fact the place is shown as far less important to the married daughters than to those who come to it without having been born there. It looks like the book is out of print, but I’ll keep my eye out for my own copy. I amn’t sure what Julie is doing as her next book, but I strongly recommend her podcast for the future, as well as going back to the China Court episodes. 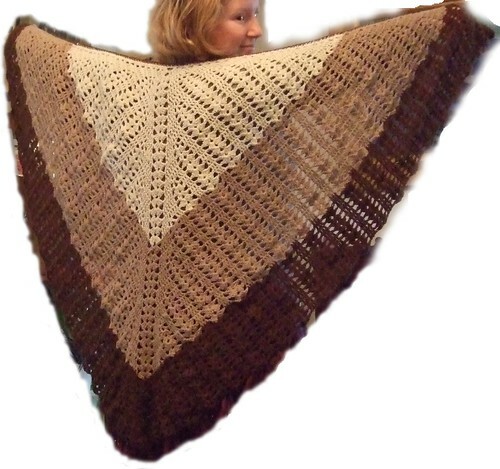 There’s me with my newly finished Seraphina’s Shawl, and I really like it, although I haven’t got used to how to wear it comfortably and flatteringly yet. Any ideas? This is my new piece of clothing for Pesach, although I got myself a new pair of Shabbos shoes, that are navy, so they don’t match it, and will have to be worn with a different outfit. I didn’t have enough of the brown to do a row of dc along the bottom, but I really like the unifying effect of the double row across the top. I haven’t done any crocheting since Friday, I’m afraid, as last night and this morning I’ve been Pesach cleaning instead. I cleaned my laptop today, by which I mean I drew a diagram of where the keys all go (this stage is very important! ), took them off, washed and dried them, then cleaned (ie brushed and vacuumed – don’t use liquid on a laptop!) underneath. Once all that was done and the keys were properly dry I put them back. I recommend opening a blank notepad file for this, both because it allows one to confirm the key is right before putting it back, and also because in any other program (or none) hitting keys at random can potentially do damage. Some of the keys are now a little stiff (especially the space and shift buttons) although I don’t really get why, seeing as there should be far fewer – if any – crumbs or bits of dust underneath. Hopefully that will loosen up shortly. This is a humorous recounting of the fun, trials and tribulations of preparing for and experiencing Pesach, which actually has more proper information (as opposed to just comedy, which is there in spades) than I had expected. It’s in a similar style to the author’s weekly column in Hamodia, and shows that he can hold together a much longer piece. And, in fact, the book is well integrated, rather than being unconnected essays. 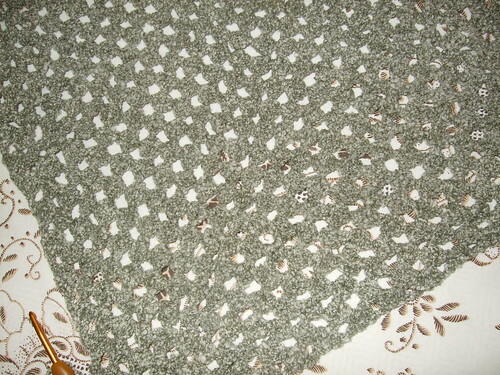 Besides the cleaning, I have at least three crochet projects to finish by Friday: frog, dog and shawl. Wish me luck! I’ve now made just over one hundred posts to this blog, and I’m up to one hundred books read in this civil year. This is a very well written and intriguing book. It describes Davaa’s journey to making the film of the same name (which I haven’t seen, although after many many recommendations I did see her other film, The Story of the Weeping Camel, which was wonderful), some of her experiences during the making, and the story portrayed in the film. What it doesn’t do, is to distinguish the real life of the family portrayed from the pre-planned story the directors set up. The book does make slightly clearer than the other film did that this isn’t an absolutely straight documentary, but is never explicit about it. There is, of course, a large amount of overlap, which I think is part of the point of the exercise, but a bit of me would like to know more precisely about the Batchuluuns’ real lives. On the other hand, perhaps this way gives them some privacy back, while giving some of us non-Mongolians a taste of how this vast (and beautiful, by the many photographs in the book) but unfamiliar country and people are like and unlike ourselves. The finished frog is from Lion Brand Yarns Free Patterns, and the unfinished one a pattern from the Amigurumi Girl blog. 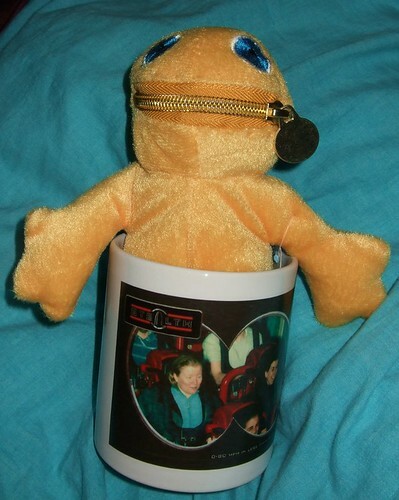 Just editing to credit my housemate with embroidering the frog’s face, since my embroidery skills are non-existent. Some day when she’s less stressed I’ll get her to teach me. Or just to keep doing it for me, as she doesn’t craft enough!